From the title of this Treknobabble, you might guess that I have seen the leaked copy of the new Wolverine movie and have caught a preview showing of the new Star Trek movie, and am about to compare the two and tell you which is the better movie. No such luck. Instead, I’ll be predicting which movie will do better at the box office with reference to the recent Advertising Age article predicting that Wolverine will be victorious. Besides, most of you would probably not want to have these movies spoiled. Some people have been writing about how some recent statistics indicate how these movies will do at the box office. Now statistics are always ripe for being misconstrued. And I don’t know if there are some “official” statistic houses that movie executives pay special attention to. So I don’t know how reliable the data used by the Advertising Age writers is. The data did come from various named sources although some of the data was gathered indirectly. At least it provides us with a jumping off point for discussion. Somehow it was determined that Wolverine would make about $100 million in its opening weekend and Star Trek would make about $50 million. The last X-Men movie, The Last Stand, made $103 million in its opening weekend. The last Star Trek movie, Nemesis, made $18.5 million. Even the highest opening weekend for a Star Trek movie only managed $31 million and that was First Contact in 1996. First Contact was advertised as an action movie, so that bodes well for Abrams’ Star Trek. The Advertising Age article thinks that Wolverine’s marketing campaign directed at the mainstream audience as opposed to Star Trek’s high-profile marketing towards the fanboys is the reason why statistics forecast Wolverine being victorious at the box office. It’s interesting that one example they use to illustrate the broad-based promotion is an April 13th television episode of CBS’s How I Met Your Mother in which the characters sparred with toy Wolverine claws. Since CBS owns Star Trek, I wonder how CBS allowed one of its highly-rated television series to promote a competitor’s movie. CBS did have its highly rated drama CSI pay a transparent homage to the Original Series with its April 23rd episode. It helped that the story and screenplay were provided by people who had worked on later incarnations of Star Trek and who were also part of the CSI staff. On television, Star Trek movie commercials seem targeted for science fiction or geek genre type shows like Heroes and Lost. From my viewing habits, I have verified this although I don’t watch much non-geek genre television. Wait, I do watch Gossip Girl, One Tree Hill, and 90210 and I don’t recall a Star Trek commercial being shown during these television series. A recent Variety article says that the newer Star Trek movie commercials are being shown during American Idol and Spike TV’s Total Nonstop Action Wrestling. Advertising Age goes on and undercuts its argument by mentioning some major promotional pushes for Star Trek to the non-fanboy population. MTV Networks is doing a promotional blitz for Star Trek. MTV Games involvement with the popular video game Rock Band allowed for a Star Trek “Battle of the Bands: Rock the Galaxy” contest. Not mentioned are Star Trek Photobooths that are being set up at special events and dance clubs, and Star Trek Dance Parties that are being held in various locations including Los Angeles and New York. Also undercutting its argument is the fact that Paramount spent sparingly on the Sci-Fi Channel. Wolverine did go for the basketball crowd with promotion during the NBA playoffs, but both Wolverine and Star Trek had trailers shown to the football audience during the Super Bowl. The Advertising Age writers claimed to have obtained data in which 80% of surveyed moviegoers claimed to be aware of the Wolverine movie whereas 63% had awareness of the upcoming Star Trek movie. To bolster the evidence that Wolverine will be bigger at the box office, nearly half of those aware of Wolverine expressed “definite interest” in seeing the movie versus a third for Star Trek. To market Wolverine, Fox’s promotional business partners include 7-Eleven, Schick, Papa John’s pizza and the California Milk Processor Board. For Star Trek, Paramount has Burger King, Lenovo, Kellogg, Nokia, Verizon and Esurance. (As an aside, take note that as a result of the current bad economy, neither of the movies have the backing of an auto manufacturer.) Offhand, I can’t determine which movie has the better set of partners. Based on the awareness statistics, maybe these partners aren’t all that important unless 7-Eleven is more popular than I thought it was. Chris Pine may have been chosen as a rising star of 2009 by Entertainment Weekly and various other publications and web-sites, not to mention being the recipient of the ShoWest Male Star of Tomorrow award for 2009, but Hugh Jackman currently has the higher profile with women, I think. Even with women under 24, 38% expressed a “definite interest” in seeing Hugh Jackman, while 18% expressed this for seeing “Star Trek.” Now I’m guessing that the wording of the question is important in this case. If they had shown the young women a photo of Jackman and of Pine, and asked the question of how much interest they would have in seeing a movie with each actor, then I would hope that Pine would score at least, or even better, than what Jackman would. In support of the data that Advertising Age referenced, an article in Variety reported the findings from a recent poll of people under 25 years of age conducted by MovieTickets.com: 67% intend to see X-Men Origins: Wolverine during its opening weekend whereas 44% intend to see Star Trek. The Variety article writer claims that the under 25 crowd is largely unfamiliar with Star Trek! Maybe she’s right. The ad slogan for Star Trek, â€œThis is not your father’s Star Trek,” is clever, but it’s somewhat condescending to the timelessness of the stories told in the Original Series. (It’s also sexist!) I realize that young people care more about visual effects than story, so the slogan is probably apt in describing the upgrade in the visual effects. A month or two ago, I came across a blog post at a Star Trek site in which a grade-school kid interviewed his classmates about Star Trek. When he asked them to think of a word that immediately came to mind when they thought of Star Trek, the following words came up: cool, space, and gay. Hmmâ€¦ One was positive, one was neutral and one was somewhat negative, I would think. I guess that pretty much summarizes the opinions of the general populace. Ha ha. I know it’s unscientific to poll acquaintances to get a general idea of how people feel, but bear with me. My 11-year-old nephew is a Star Wars fan. He is aware of my Star Trek fetish. I have never tried to steer him into becoming a Trekkie. I asked him if he had seen any of the previews for the new Star Trek movie. He said, â€œYes.â€ I asked him if he and his friends were going to see the movie next month. (I don’t think he realized when the movie was coming out, but I think at his age, kids don’t plan ahead and simply live in the now. Well, at least that’s the way my nephew is.) He was hesitant and then he coyly said, â€œMaybe.â€ I think he was trying to spare my feelings. Incredulous, I then asked him why he didn’t think the preview was exciting as a Star Wars movie. And then he hid behind his mother. I don’t know how the availability of a leaked copy would be factored into determining box office results. Everything I’ve read for this Wolverine case would lead me to believe that the ready availability of this work-print will not affect the box office by a large amount. Would this opinion be any different if a leaked copy of the final film was available? Do people generally believe that bootlegging does not make a big difference to the box office? I searched around for reviews of the leaked copy, but it was difficult filtering out the stories on the copy being leaked. Fox News columnist Roger Friedman wrote that the movie “exceeds expectations at every turn.” And then he was fired, or at least amicably parted ways with Fox. Some have noted good and bad things about the leaked copy itself. The middle boring parts of the movie were supposedly the reason for the millions spent on reshoots and more visual effects. The official company line is that the leaked copy was a work-print with some missing visual effects, but it was a nice way of saying that the movie wasn’t great as originally written and executed. I realize that probably all blockbusters go through some sort of audience testing and retooling. Even Star Trek is not immune to this. The handling of Kirk’s death in Generations is famous in Trekkie lore. And Abrams did some extra shooting for his Star Trek after the original shooting schedule was over. International premieres for the Star Trek movie have generated positive buzz as did the surprise screening in front of an audience expecting to see â€œThe Wrath of Khan.â€ Some people were disappointed that Wrath was not shown. Ha ha. Surprisingly, quite a few people in the audience hadn’t seen Wrath, judging by a show of hands during a pre-show question for the audience. It should be noted that some people have commented that Wrath is better than the new Star Trek. I’m surprised a theatre-cam version of the Star Trek movie isn’t available on the Internet by now. If we take a look at the box office grosses for the X-Men movies compared to the Star Trek movies, then we might extrapolate and be led to believe that Wolverine will come out on top. But we too often linearly extrapolate and that is highly erroneous for use in predicting box office performance since there are too many interrelated factors that affect how moviegoers decide which movies to see. As they often say when investing, past performance is not a reliable predictor of future performance. It is interesting that the X-Men movies have made more money world-wide than Star Trek has. I would not have believed it myself had I not seen the numbers. After all, Star Trek has ten movies compared to X-Men’s three. It’s not a wide margin, but still: $1.16 billion for X-Men versus $1.08 billion for Star Trek. For the US only, Star Trek fares better with $757 million versus X-Men’s $607 million. Unfortunately, this only goes to show how much less world-wide appeal Star Trek has. It’s no wonder that the Star Trek movie is currently being given so many international premieres with J.J. Abrams and the stars in attendance. This lends credence to my argument in a previous Treknobabble that Star Trek isn’t as popular world-wide as I was led to believe. Or maybe X-Men has a world-wide popularity that I’m not aware of? With the last Star Trek movie having performed the worst domestically and globally of all the Star Trek movies, it’s probably a good idea that the new Star Trek movie is distancing itself from what came before. With the critical drubbing that the last X-Men movie got, I thought that it did poorly at the box office, but it turns out that it has been the most successful! Whereas Star Trek has nowhere to go but up, the X-Men franchise could potentially plummet. Remember that investment adage I mentioned earlier? Funnily enough, the X-Men including Wolverine have encountered Star Trek crews on two occasions. â€œWhat?! ?â€ you might be thinking. No, you didn’t miss a Deep Space Nine or Enterprise episode in which the X-Men made a guest appearance to promote an upcoming X-Men movie. Nor am I making a sly reference to the fact that actor Patrick Stewart played the parts of Captain Picard and Professor X. There was a Star Trek X-Men one-issue comic published in 1996 (Trek was celebrating its 30th anniversary; Marvel, its 35th) in which the crew of the Original Series meets the X-Men. (It’s amusing that Kirk flirts with Phoenix before Phoenix quickly interjects a statement about her husband, Cyclops.) And later, the crew of Star Trek: The Next Generation also met some X-Men in another comic as well as a novel called Planet X published in 1998 and written by the prolific and popular Star Trek scribe, Michael Jan Friedman. At the time, the crossover of these two franchises most likely was made possible by Marvel Comics making a deal with Paramount Pictures to publish several titles of Star Trek comics. This was near the height of Star Trek’s popularity with the recent self-imposed end of the Next Generation television series. One connection between the X-Men and Star Trek is Chris Claremont. He had a sixteen year stint writing for The Uncanny X-Men comic. He wrote many of the classic X-Men storylines (the second X-Men movie was supposedly based on a comic story of his), and co-created many of the X-Men characters (but not Wolverine). He wrote an excellent Star Trek graphic novel in 1992 called Debt of Honor that ties into the Star Trek movies. I wasn’t able to find out whose initial idea it was for the crossover though. In the comic where Spock initially encountered Wolverine, Spock rather easily dispatched Wolverine with a nerve pinch after Wolverine knocked a phaser out of Spock’s hand. Star Trek wins! 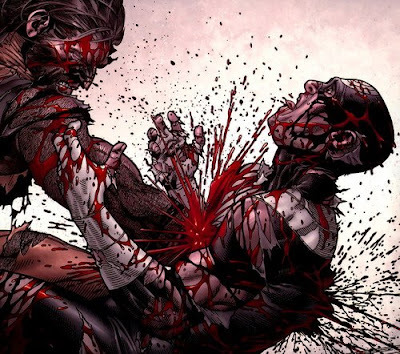 However, a few comic panels afterwards, Wolverine quickly recovers due to his healing factor and gets the upper hand, or should I say claws, on Spock. Maybe this is foreshadowing that Star Trek will have the bigger opening weekend, but Wolverine will out gross Star Trek by year’s end. I’ll admit that I can’t be objective in determining which movie will get the better opening weekend. It has to be Star Trek. As for my best educated guess for its box office take during its opening weekend in the US, and in the spirit of Vulcan precision, I predict Star Trek will make $110.293591 million dollars. If that’s not optimism, then I don’t know what is. Let’s hope that Star Trek gets the upper hand. I plan to watch it in the theaters, where as I don’t have any interest in Wolverine. Oddly enough, at this juncture I think Wolverine seems more tired and played out than Star Trek. Update: While watching “90210” and “One Tree Hill” this week, I saw a Wolverine ad. LOL I’ve never seen this comics, and that action positions is just awesome. I believe that Star trek will win this fight, but not by far I must say. Jerry, when you say “action positions is just awesome,” I take it that you’re referring to the action figures photo I took of the Original Series crew ganging up on Wolverine. If so, then thx. I’m pretty proud of photoshopping out the “invisible” thread I used in order to be able to have Kirk perform his patented flying drop kick to Wolverine’s head. I’m not much of a photoshopper. At first, I tried to light the scene so that the “invisible” thread couldn’t be seen. I’m not much of a star trek tv show fan, but the movie looks to be better than x-men origins. I saw the movie x-men origins wolverine, but i wasn’t impressed. The new star trek movie seems to be action packed, atleast that’s how the commercials make it seem. W’re out…..going to see the movie right now. Later. Dammit, Wolverine beat Star Trek! I’m a Trekkie, not a prognosticator! Dammit, I thought this would actually be about the crew of Enterprise vs. Wolverine, and who you thought would win in a fight.